If you're reading these articles in order, by now you should have a Hyper-V host called CARBON and a virtual machine on that host called Hydrogen with a clean install of Windows Server 2012 R2. 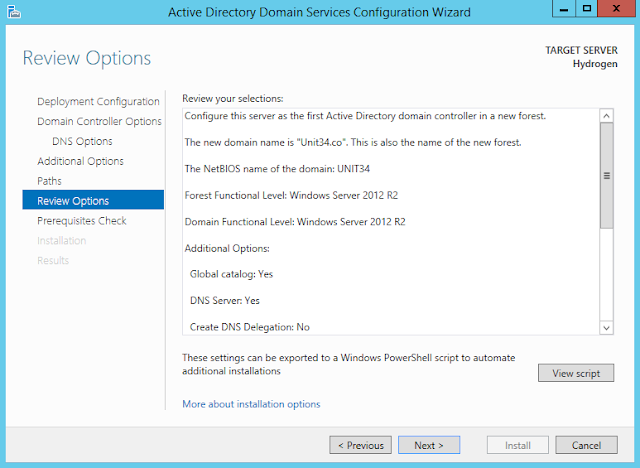 The next step is to install and configure Active Directory Domain Services (AD DS) on Hydrogen to create your first domain controller and your domain Unit34.co. Start by logging onto Hydrogen. Server Manager should start up automatically. If your haven't renamed your server to Hydrogen, make sure you do that now. Just like one of the previous articles where we install the Hyper-V role on CARBON, install the Active Directory Domain Service role in the same way on Hydrogen. Continue through the wizard until you get to the Server Roles page. 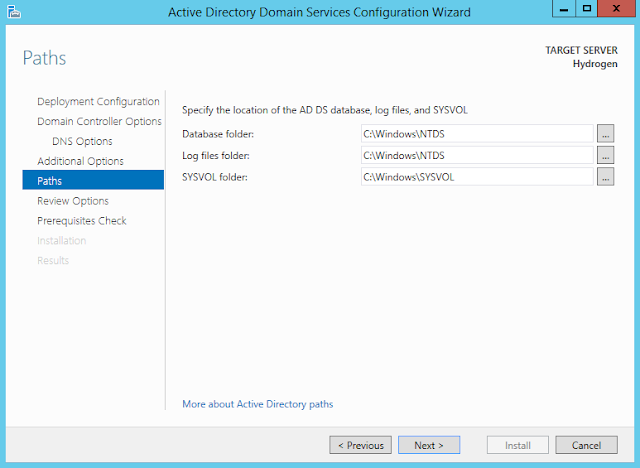 Select the role Active Directory Domain Services. Leave the features selection as is on the Features page and continue through the wizard to install Active Directory Domain Services. Once Active Directory Domain Services is installed, close the wizard. Active Directory Domain Services can be installed on a server without it being a domain controller. 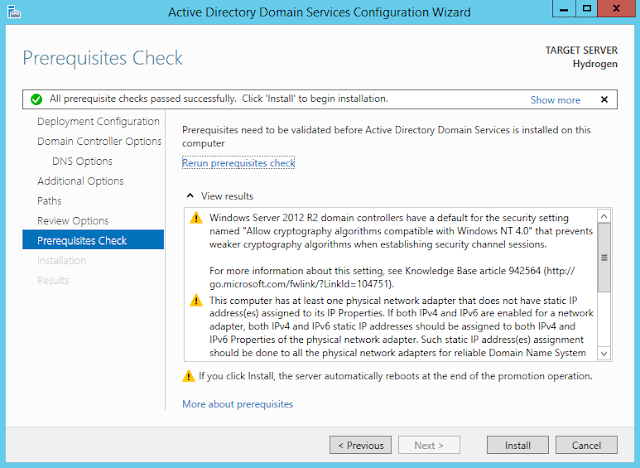 In order to make a server a domain controller we need to promote it in the domain. 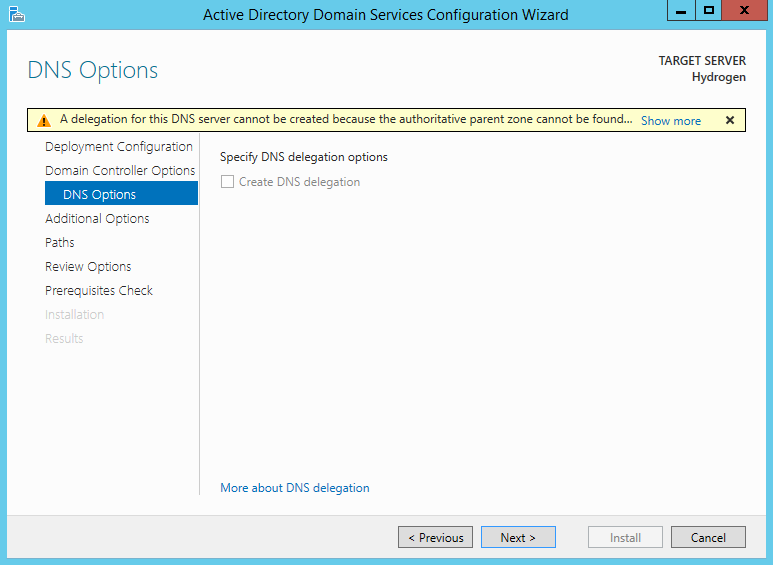 As part of this process, the DNS Server role will also be installed automatically as this is our first domain controller. Step 1. Go back to Server Manager and click on the flag icon in the top right. There should now be an option to Promote this server to a domain controller. Click on this option to start the Active Directory Domain Services Configuration Wizard. Step 2. Select Add a new forest and enter Unit34.co as the root domain name. Step 3. 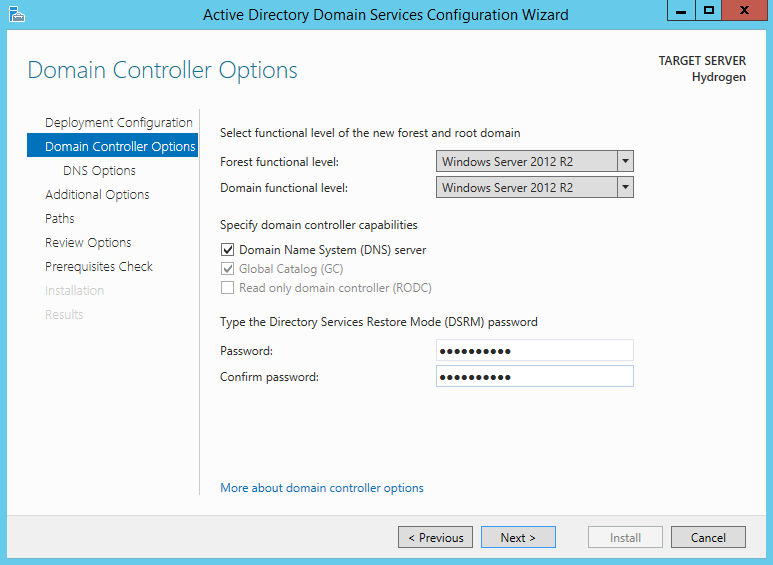 Leave the forest and domain functional level on Windows Server 2012 R2. Make sure Domain Name System (DNS) server is checked and type in a password that you can remember for Directory Services Restore Mode (DSRM). Step 4. On the DNS Options page just simply press Next ignoring the warning. Step 5. 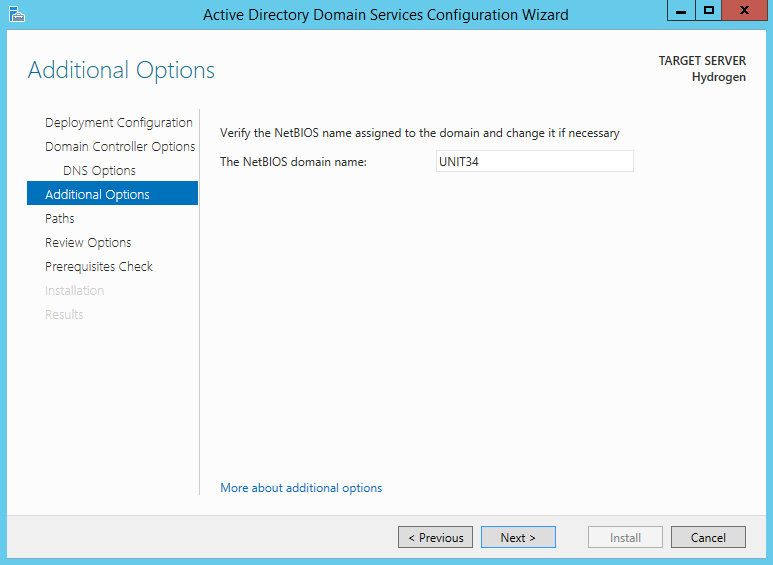 Leave the NetBIOS domain name as UNIT34. Step 6. Accept the default paths and click Next. Step 7. Review your configuration options and click Next. Step 8. Review the results from the prerequisites check and make a note that we need to assign the server a static IP. We can ignore all the other warnings for now. 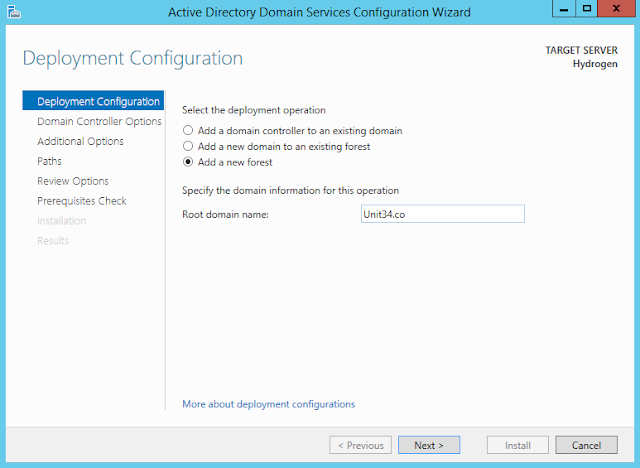 Complete the configuration wizard by clicking Install. The server will restart automatically. Once the server has been restarted. 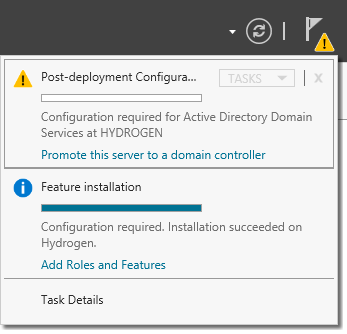 Hydrogen will be promoted to a domain controller and the local administrator account will become a domain account. We aren't done configuring our domain controller yet. In our next two articles we are going to look at installing and configuring the DHCP Server role on Hydrogen as well as configuring the DNS Server role.